You will find that when you buy blush wine online, you get the price, reviews and often times, a rating from either Wine Spectator or The Wine Advocate, all without setting foot outside your home. Nothing is more frustrating than driving from one store to another when you are looking for one particular bottle of blush wine. Purchasing blush wine online solves not only this problem, but also many more. Better prices - You will often find great deals and specials online that you won't find at your local wine merchant. Wider selection - This is especially important for those of you that live in smaller towns and cities. It's easy - All you have to do is choose your wine, enter some personal information and your blush wine will be on its way. It's secure - Using your credit or debit card online is just as safe as using it at your local grocery store. Everything is encrypted and just about every Internet service provider and off the shelf personal computer has built-in security programs and firewalls to further protect your personal information. If you are still worried, clean out your web cache every time you enter personal information when making an online purchase. If you are still concerned, check the fraud liability terms of the credit or debit card you are using. Most banks and major credit card companies offer zero fraud liability. The Wine Web - Choose from a $4 bottle of E & J Gallo Livingston blush to a $122 bottle of Frey Vineyards Organic and everything else in between on wineweb.com. Wine Chateau - Search through this website's vast selection if you are looking for a blush wine that is a little bit out of the ordinary. The Cellar Online - Peruse the large assortment of blush wine at various price points at The Cellar Online website. Shoppers Vineyard - This website offers a wide variety of blush wines from California, Italy, Spain and France. With that wide of a selection, you will be sure to find what you are looking for. Wine Messenger - At the Wine Messenger website, you will come across inexpensive, highly rated blush. Wine Library - This website offers blush wine produced from Pinot Noir grapes to Cinsault to Syrah. Check out winelibrary.com when you are looking for a large selection of blush wine offerings. Wine.com - Offering one of the widest varieties of wine online, you will have no problem finding the perfect blush wine for you. There are hundreds, if not thousands, of online wine merchants from whom you can buy blush wine. Keeping a few of the following search tips in mind will help you find exactly what you are looking for without having to spend hours in front of the blue glow of your computer screen. 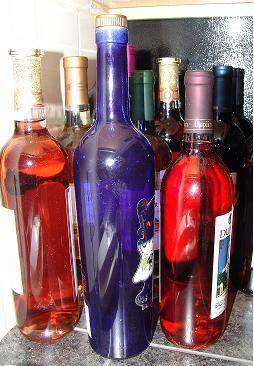 Search for blush wine aliases - If your search results of blush wine come up empty, search rose or white zinfandel. These are the same types of wine, just different names. Be sure to check delivery availability to your state - Not all wine merchants may ship to all 50 states. Before you begin perusing any website for the perfect bottle of blush, make sure the online merchant can ship to your state. All the websites listed above offer a tool in which you can check to see whether or not they can ship wine to your state. Consider buying wine by the case - You will often find even greater discounts when ordering wine by the case. You will find that many online wine merchants will include wine ratings from respected wine magazines such as Wine Spectator and The Wine Advocate. Even though these ratings are given by highly respected sommelier's, wine connoisseurs, experts and the like, in the end they are all just opinions. So, take them into account when making your blush wine purchase, but don't take them as your only consideration. If you stick to drinking the wine that you love, you will always love the wine you are drinking.